Photos - Doctor Who 5.10 "Vincent and the Doctor"
After the heartbreaking conclusion to last week’s “Cold Blood,” it seems as through the Doctor and Amy are heading to somewhat lighter territory with next week’s episode. Sure, there will still be a monster, but it certainly doesn’t seem as if we’ll be dealing with genocidal Homo-reptilians. In fact, we’ll even get to meet Vincent van Gogh, played by Tony Curran (The League of Extraordinary Gentlemen, Flight of the Phoenix). 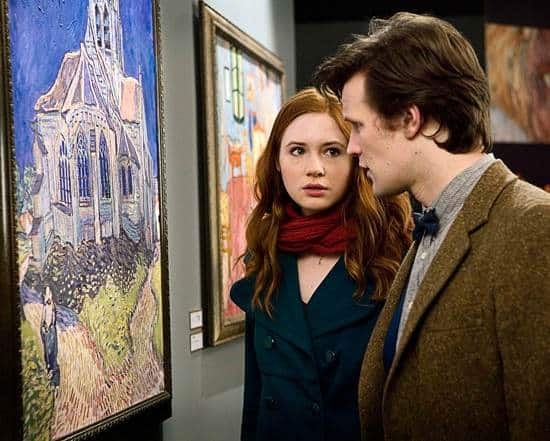 Promotional photos show Amy and the Doctor at a museum (whose curator is played by Bill Nighy, who isn’t pictured), looking at van Gogh’s paintings. They find a clue there, and decide to go back and visit the artist, and discover that he is being terrorized by a horrible monster. The monster is so horrible that in order to face it, the Doctor needs a weird sort of rearview mirror contraption to see it. Meanwhile, van Gogh tries to fight it off with the sharpened feet of an easel. The episode looks pretty solid, and hopefully we’ll get a further examination of the Doctor’s inner conflict after the horribly sad events of “Cold Blood” (which I’m still not quite over myself). In the meantime, check out these promotional pictures for the episode.